I've been dealing with the same guy at GC for about 10 years. He seems to do quite well for himself, local musician with a good gig too. He'll always try to sell the warranty but he knows to get thru that quickly because he already knows the answer. Now all they have to do is fire half their employees and replace them with decent people. I wonder what they say about you ? No, nothing much I wouldn't think. See my post earlier in the thread. It's just that the "specialists" seem to be pretty clueless and I haven't been impressed by what they have tried to sell. That's about it. I don't believe GC invests in keyboard 'specialists ' these days. This is a throwback to 15-20 years ago . What I see, 98% of the time, are salespeople with sketchy general knowledge trying to fake their way on a keyboard discussion. To fire off questions of " Kronos vs Montage/MODX"
is a futile use of time at my GC's. So why bother. ? Of course, us keyboard fanatics are going to be all over every new board. GC does not bother with this instant specialization. Its mostly box moving, making some margin, handling returns. Turning the lights on in the morning and off at night and locking the door. Basic. GC understands us keyboard people are all over the internet for details and sharp pricing. They carry stock at the warehouse to support on line sales. Greg the problem with that is you are alienating large percentages of people that might buy if GC had stock. This would be true in medium to large cities. GC has a real bad reputation with a lot of musicians and don't seem to be doing much about it. I realize it's expensive to keep inventory around but if they want to cater to pro players on any level they have to have some gear for us. Otherwise people will just go to proaudiostar or Sweetwater. Ash is stocked much better around my neighborhood... I have had a problem with that with GC for a while now! Very true...they used to be much much better! I refer again to my post much earlier in this thread: This certainly seems to be a regional-local thing. My nearest and regular GC has a great Pro-Audio and Keyboard Department. In fact they just redid the whole Pro Audio and Keys area. They also have a couple knowledgeable people back there who know the difference between a montage and a Kronos, etc... Not all of them, but enough. Now then, as I also mentioned before, the next closest 15-20 miles down the road-----is a horrible store. Haphazardly set up pro audio and keys area. Too many broken things. Nothing plugged in to audition..etc..
As far as stock between Ash and GC, again, I think that's regional. The ASH out here does stock a lot more pro-audio items, and they do have some of the more boutique keys on display, however, whether the keys are in stock is another question. The employees are top notch, however. I found that if you just ask, they'll set up anything you want. When I was shopping for my Les Paul, my salesguy was tweaking them as I was trying guitars out. Good as he is, I don't expect him to explain the midi implementation on a Montage or know all the differences between a Kronos and other boards. I don't expect him to switch on a dime for a masterclass in DMX programming. My local GC is stocked. $50K in Diezel & Friedman amps sitting 12' from the front door. They didn't have MODX but they did have a Genos, not hooked up lol. 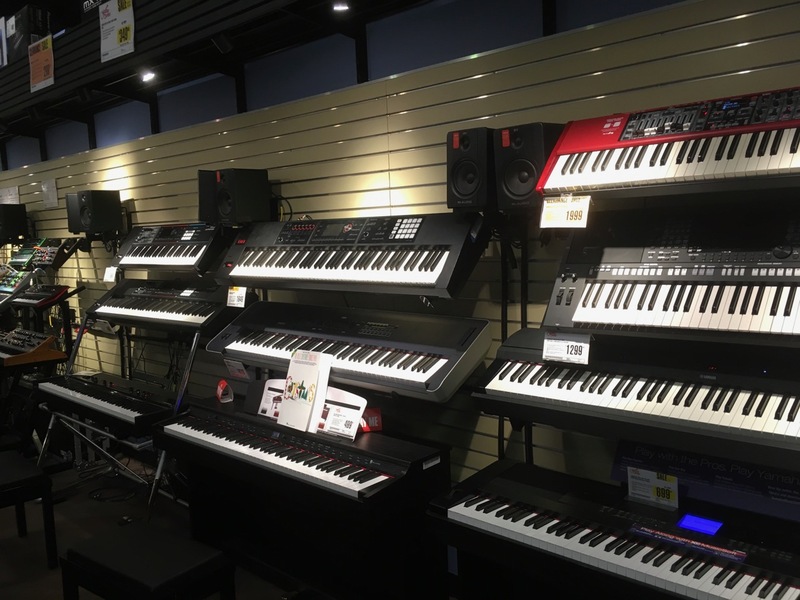 When I first started shopping in music stores about 35 years ago, other than Keyboard magazine, the salespeople had first-hand knowledge of the latest and greatest gear. It was also great that they knew how to program sounds and play too. 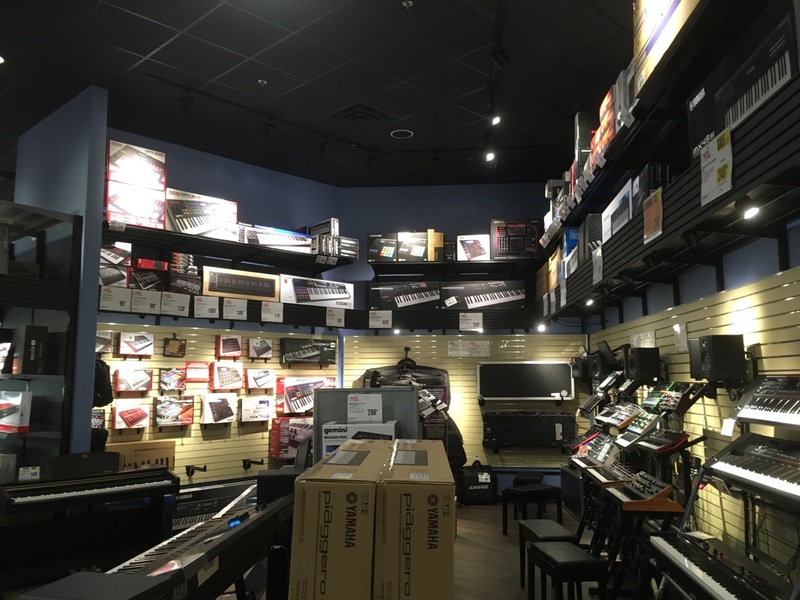 Fast forward to the internet-age, with so many reviews and online video demos, most musicians are walking into the music store armed with just as much if not more information than they had access to in the past. Surely, it would be great if the salesperson had the same product knowledge but then the whole shopping, buying and selling experience could possibly turn into a gear-geek-fest discussion about samples, KB action, modulation routings, filters, KB comparisions, etc. Nowadays, Guitar Center and any other music store I walk into provides me with a place to lay hands on the latest gear. Personally, I don't need a salesperson to explain anything. I just want a representative of every new KB out on the floor, fully intact (keys, knobs, buttons, faders) and connected to a decent audio system. Of course, as a seasoned veteran KB player, I take my own headphones to the store. Besides, I don't want to give a free concert, masterclass and/or field questions about whether or not I give private lessons. However, music store salespeople should know enough to properly help the mom or dad who is buying a KB for their budding musician. Then, those folks are not looking at a Kronos/Montage/MODX. Brick and mortar music stores have a tough row to hoe between tire kickers, lowballers and having to compete with online retailers too. I'm always going to buy gear from my local brick and mortar music stores because for 35 years and counting, they have been great to me. The guy who sold me my first synth rig was very knowledgeable and could really play. This was before a buyer could take that knowledge and shop for a better price online. The issues here are really our own doing and the result of the internet age. Best price and the best pieces in stock setup and ready to play. But that goes for everyone else that wants to bang out something on a $4k workstation. So the equipment degrades and doesn't get replaced. Some of those old beater Fantoms at guitar center were a testament to their reliability. The road has nothing on GC traffic. What you say is true brother Prof D, but then you are close enough to Chuck Levin's for your preference to work. The few music stores close to where I live hardly have any keyboards, they focus on guitars, amps, mixers, small PA equipment. So I don't bother. Of course, I haven't bought equipment in years, I retired from active playing 8 years ago. Most of my audience is in the cemetery. I've dealt with Proaudio Star and Sweetwater. 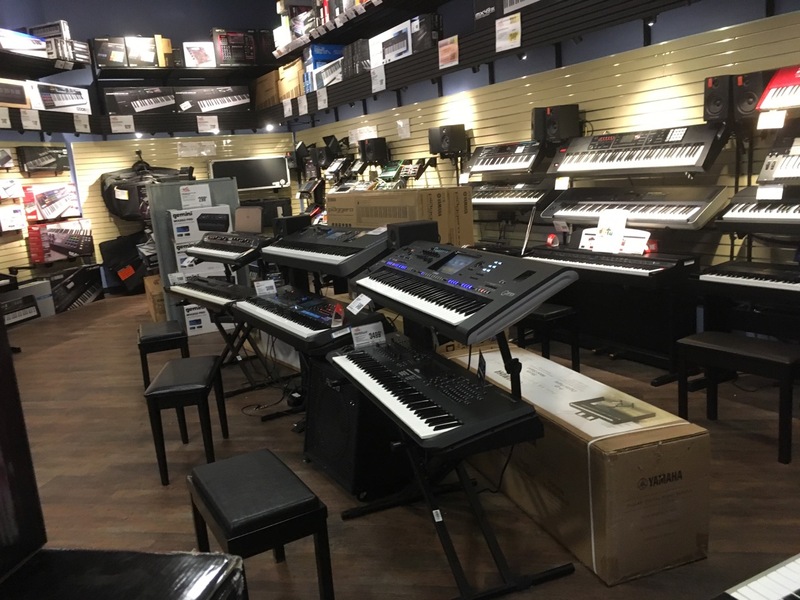 The manager at the Sam Ash store near me (Westminster, CA) has told me that their policy now is to carry (in-house stock) on only keyboards under $1200 (will not carry any keyboards more expensive than that). Thus, they are no longer catering to professionals as their customers. The majority of their business is accessories, grungy-sounding equipment, and beginner gear. Unfortunately, that means that if I want to put my hands on any professional-grade keyboards, I have to either try GC or go all the way up to Los Angeles (and, once there, those stores are not a pleasant experience at all, and next to impossible to actually hear anything you are playing, even wearing one's own headphones). In my opinion, the brick-and-mortar stores have sealed their own fate, forcing one (me) to buy on-line (Sweetwater et al), mailing equipment back and forth to even just try-out anything. Visited the Roseville Guitar Center on my trip this weekend. They always have a lot of keyboards. Interestingly enough, every employee was polite and helpful this time (it HAS been two years) and the store seemed to have been freshly remodeled. They DO have large guitar and PA speaker sections, but the recording/computer and keyboard sections are almost as large. I took some pics to show what I mean. Interestingly enough, unlike other times, they were low on Nord and Korg products, no Kronos, no Krome, no Kross 2 61, no Nord Stage or Nord Piano either. They used to have most of those. But they had a lot of high-end keyboards. Just in the front they had a RD-20000, and SV1-73, a Montage 8, a MODX8, a Montage 7 and a Genos. Lots of modules etc too further back. Edit: I'll post pictures when I can. Looks like my image host is down (IMGBB). I just had a very good experience with the Richmond, VA GC. They pre-ordered an AX-Edge a week before I showed up (I was only in town for one day) and let me try it out for as long as I wanted before I committed to the purchase; then they gave me very good credit for the AX-Synth and RT-20 pedal I traded in, and additionally discounted the AX-Edge price significantly. The process couldn't have gone better. Visited the Roseville Guitar Center on my trip this weekend. Oddly enough, I was in Minnesota the week before, and visited this GC as well.
" Well, that's good for trying out stuff. Now all they have to do is fire half their employees and replace them with decent people." 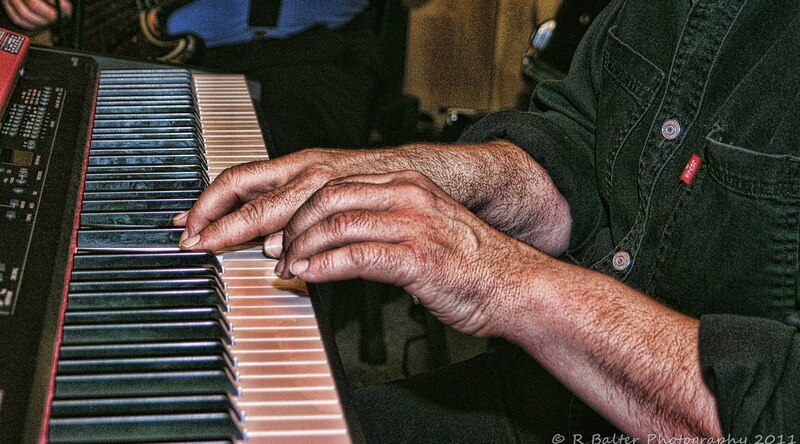 Ok, pictures from the Roseville Guitar Center's Keyboard department. Looking down the one side. Lots of modules and knobby synths down at that end. I don't have any closer pictures. Moog Grandmother, MiniNova, some DSI synth, Matrixbrute, Behringer Model D, Sub Phatty, MPC stuff etc. Korg Grandstage 88, Roland Juno-DS88, Juno-DS61, Williams garbage digital of some sort (Overture 2? 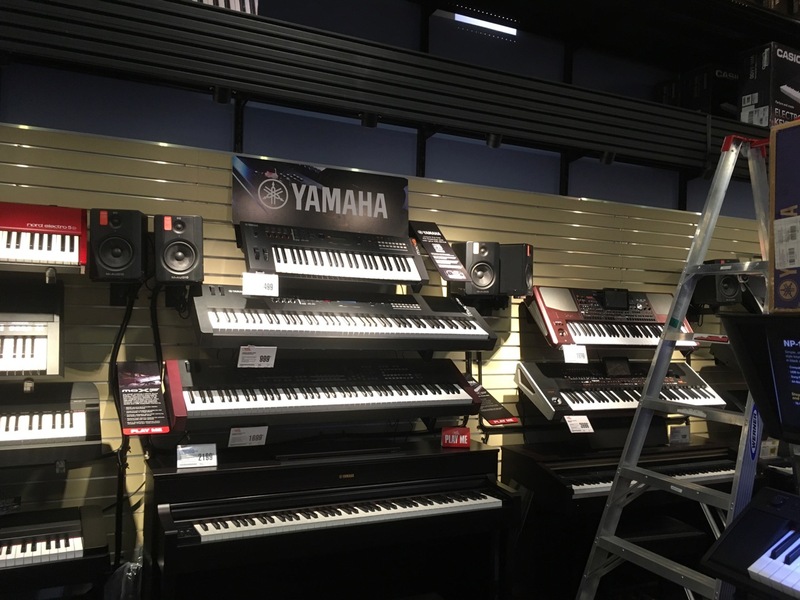 ), Kross 2 88, FA-08, Yamaha DGX-660, Yamaha P515 (I think? Maybe P255), PSR-S970 (I think), Nord Electro 5 73. A Yamaha Arius digital model, MOXF8, MX88, MX49 (V2), another Yamaha Arius console, Korg PA4X 76, Korg PA-1000. Assorted Casio and Williams products. Casio CGP-700 on the bottom, various Casio CDP models above it along with an arranger model. Etc for the other two rows (mostly Williams stuff). Yamaha PSR-E463, P45, YPG-535, some PSR model (low end again, I don't recall the model number) I think. So lots of stuff. Nice to try out the new boards, it's been a while since I've had the chance (over a year for new stuff). 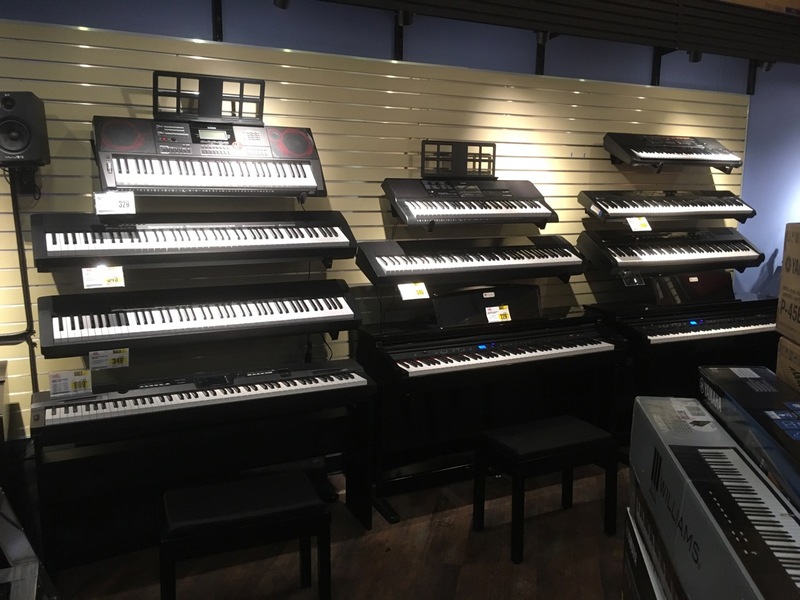 Some odd omissions since in the past the store was overrun with Kronos, Krome, and Nord keyboards. No 76-key versions of any of the new models (FA-07, DS-76, MODX7) or 61-key versions of some, but pretty decently stocked otherwise I think. No clonewheels other than the Electro 5 and no Kurzweils. ^^I had to use large pictures so detail could be made out. My usual scaled size of 400-500x300-400 wouldn't work. The only truly great GC I have ever visited is also there, in Edina. Beautiful clean store, helpful employees who actually call you back when they say they will, and bountiful stock. Interestingly (or ironically), the flagship Guitar Center Hollywood store in Los Angeles just celebrated its remodeling last weekend to much fanfare with an outdoor concert on Sunset Blvd by Anderson Paak. I do remember when that was the only GC around. I got my first synth ever from there (Yamaha DX7) back in the '80s. I never envisioned them to be a nationwide chain (kind of like how I remember the Black Eyed Peas was just some local hip-hop band in L.A. some 22 years ago; I never pictured them to be mega pop stars). I do think the GC expansion is pretty ridiculous, maybe they should only be in the major music centers in the US: Los Angeles, NYC, Chicago, Nashville, New Orleans, Austin, Seattle, San Francisco, Las Vegas, Detroit, Boston. The Twin Cities is the hub for the rest of the state here. I just spent a couple hours at Guitar Center in San Francisco. I am here on a business trip. Spent a lot of time on Korg Prologue 16 which sounded great, and did some light time on Subsequent 37 and Roli Seaboard. The Prologue sounded great. Wish I could have compared it to a Prophet Rev2. They also had Prologue 8 and Minilogue, along with Mininova and Roland Boutiques. I spent a lot of time on Komplete Kontrol. I love that too. Really a nice setup. I liked the feel of the MODX 7 but wasn’t really in love with it. I didn’t touch the Montage and I just don’t think I’m a Yamaha guy personally. 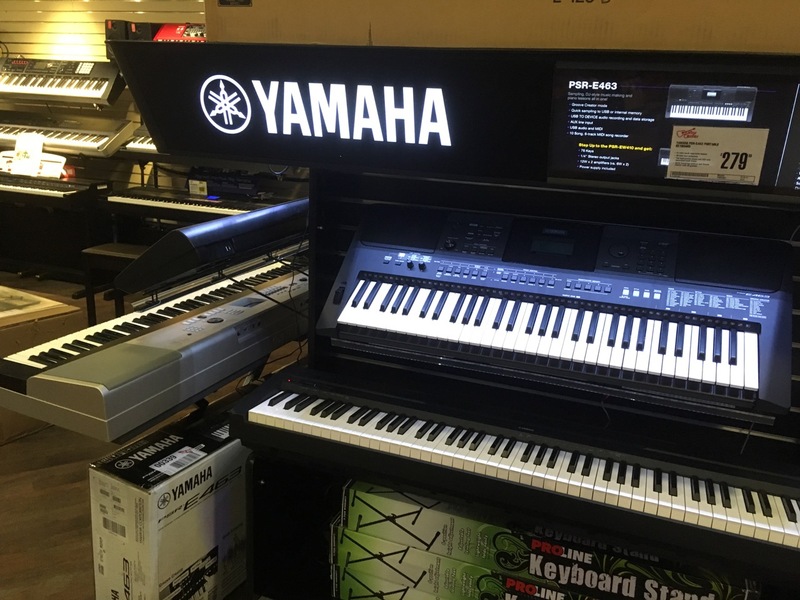 They had Nord Stage 3, Electro 6, Kronos, Vox Continental, Grandstage, Rolands..
Its a nice experience in a big city market although the floor demo models are really beat up, broken keys, etc. I would never buy one of those beater floor models. maybe they should only be in the major music centers in the US: Los Angeles, NYC, Chicago, Nashville, New Orleans, Austin, Seattle, San Francisco, Las Vegas, Detroit, Boston. Sir, you wound me -- no other vendor would have been able to give me the deal I got in Richmond this past weekend -- Great trade-up on an AX-Synth, plenty of time to try out the AX-Edge they had special ordered for me, and an excellent discount on same. Shame on you! In your defense though, GC seems to like setting up pairs of stores in one metropolitan area: Pittsburgh and Monroeville PA, and Richmond and Midlothian VA. I do think the GC expansion is pretty ridiculous, maybe they should only be in the major music centers in the US: Los Angeles, NYC, Chicago, Nashville, New Orleans, Austin, Seattle, San Francisco, Las Vegas, Detroit, Boston. While I think they have maybe too many stores in some places, I find this statement bizarre. We have a bunch of stores in the Houston region, and they're mostly doing pretty well from what I gather. Like any company, they should be where they make money. And, if the statement from the CEO is true ("It used to be that you’d only go into a guitar store if you were a pro. We’re trying to help people wherever they are in their journey.") then they should be wherever they can make that happen. Houston is the fourth largest city in the U.S. and poised to pass Chicago for third in a few years. There are an awful lot of people making music here. Same goes for lots of towns that have a GC. 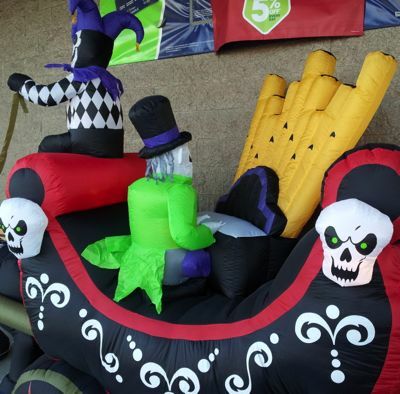 Beaumont has a store, and it has doing some of the best sales of all the stores around Houston and south east Texas. Assorted Casio and Williams products. Casio CGP-700 on the bottom, various Casio CDP models above it along with an arranger model. 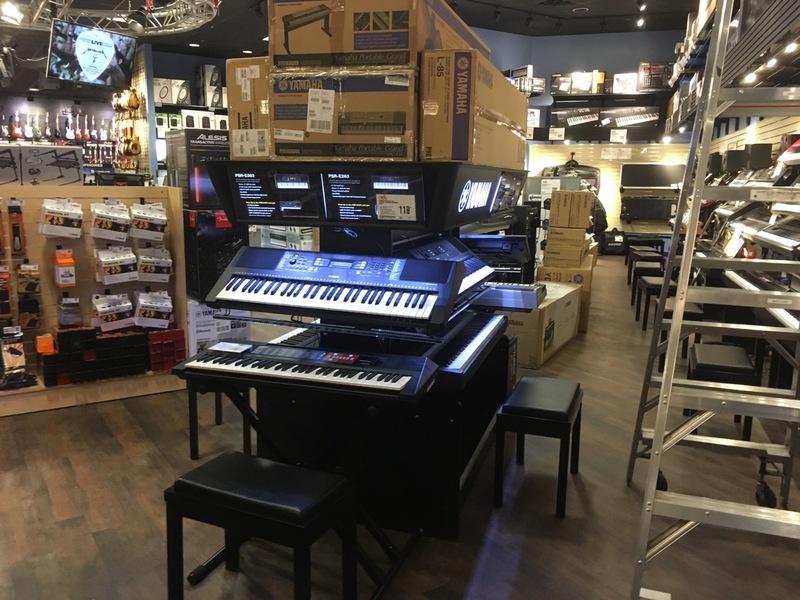 Actually, that "arranger model" is pretty impressive, both from the standpoint that the store has it (most GCs only carry the CT-X800, that's a CT-X5000) and the actual model which, if you get a chance to try the sounds, I encourage you to do so. What Casio is including for that price is pretty ridiculous. I have it, and it's WAY good. Interestingly (or ironically), the flagship Guitar Center Hollywood store in Los Ange I do think the GC expansion is pretty ridiculous, maybe they should only be in the major music centers in the US: Los Angeles, NYC, Chicago, Nashville, New Orleans, Austin, Seattle, San Francisco, Las Vegas, Detroit, Boston. I'm glad GC doesn't follow your idea here in the DC area. If I just wanted to pick up a MIDI cable, some guitar picks, etc. I'd hate to have to go all the way out to Rockville or something. I'm sure our DC area MAKCF brothers who live in MD would similarly hate to come down to Seven Corners. I'd hate to have to go all the way out to Rockville or something. I have to drive 2 hours minimum to go to Pittsburgh, and often 5 hours to Richmond. That's compared to your only needing an hour and a half to get from Silver Spring to Rockville. I'm sure our DC area MAKCF brothers who live in MD would similarly hate to come down to Seven Corners. There are five (5) GCs and one (1) Chuck Levin's within 45 minutes of my house. 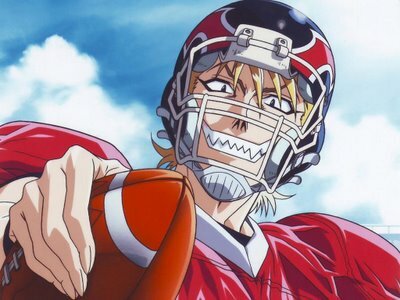 But Tom, if this guy had his way, your choices of GC would even more limited. Here we are quite fortunate. Chuck Levins for the serious synth purchases (unless my buddy at the one GC has something for me - and no, I'm not constantly leaning on him for deals), and GC for the smaller, utility needs. I kind of get what he's thinking - that if LA had only one GC, independent music stores will make more money or something. I'm not sure it works that way though. In Alexandria, we have the Alexandria Music Company, as well as the new GC on Duke St., and the Music and Arts store chain (closest being in Arlington). Let's say all GCs except Rockville close - does that mean Alexandria Music Company and Jive Sound (bassist-oriented shop) reap more profit? Not an economics expert but I don't think that's how it works. Tom - if you're making the drive to Pittsburgh, you should spend your time at N Stuff music in Blawnox. It's really more of an experience for pro players and they have a great selection with a staff who really can talk to you about the differences between a Kronos and a Montage. Family owned business and they are terrific. +1 for Chuck Levin's, too. Wish there were places like both of them.